Fine-adjustable focus on each ocular means that you can focus with each eye, then lock the ocular in place with a tiny screw. This allows you to achieve a perfectly focused image, at your working distance. 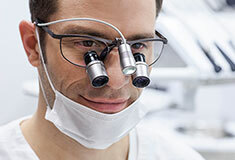 ExamVision’s unique Power-Up system means the magnification of Kepler Kompakt can be changed quickly by ExamVision – so if you want to increase or change your magnification at a later date, you can do so without investing in a whole new loupe. Stands for High Definition and refers to the unique ExamVision multi-lens system, which gives optimal depth of field and true colour transmission. The distance in which an object is entirely defined in a telescope system. In a higher quality optical system, the depth of field is higher. The magnification affects the depth of field. The stronger the magnification, the lower the depth of field, requiring a static posture to maintain the focus. An extra coating, giving more than twice the scratch resistance of the leading anti-reflection coating, plus maximum anti-reflection and superior smudge resistance. 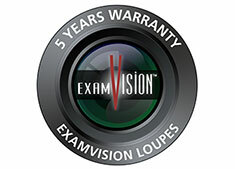 Ask your ExamVision dealer about the benefits of Super Hi-Vision on your loupes. ExamVision loupes can contain a prism, which refracts the image, allowing a more relaxed working position to reduce stress and pain in the neck and back. This can help to achieve a better ergonomic working posture. The TTL (through-the-lens) system reduces the distance between the eye and the loupe. All ExamVision loupes are mounted through-the-lens ensuring a wide field of view. 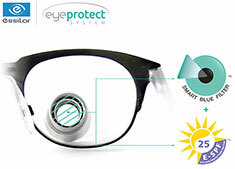 The Eye Protect System™ lenses with the UV coating Crizal Forte® decreases light-induced retinal cell death by 25%. Learn more here. Blue-Violet light photo-protective potency is measured or calculated. Measurements are done through in vitro photobiology experiments conducted by Essilor and a third party. Photosensitized RPE (Retinal Pigment Epithelium) cells are exposed to Blue-Violet light, reproducing the physiological exposure to sunlight of the 40 year old eye. Calculation model is using an interpolation method of spectral data between 400 and 455nm. This model has been designed thanks to correlation between spectral measurements and in vitro test results on outer retina cells, with a dispersion of 5%. For Eye Protect System™ lenses with Crizal Forte UV coating, 25% (+/-5%) decrease in light-induced retinal cell death versus no filter. For standard lenses: 1.5 or Poly material with Crizal Forte UV coating, about 7% decrease. The Galilean telescope consists of a convex objective lens and a concave ocular lens which give realistic images the correct way around. It is highly compact and lightweight, reducing strain during daily use of your loupes. The field of view is no greater than the width of the image. The larger the magnification the smaller the field of view. ExamVision loupes are mounted through the lens (TTL) so that the field of view is larger, giving a sharper and more defined image. A light-emitting diode, more commonly known as an LED which emits cold white light. - Brightness: LEDS are brighter than normal bulbs and concentrate light on a single point rather than diffusing. - Lifespan: An LED can last for 50,000 hours or six years constant use. ExamVision provides the LED Focus Optic Illuminator lamp with the Bundled Light Source system technology. Specially developed by ExamVision, the system creates an highly concentrated beam and prevents polymerisation of dental composites. Hi-Index glass is able to bend light more effectively than ordinary glass, so lenses can be lighter and thinner. This is especially important if you have a prescription in your carrier lenses. 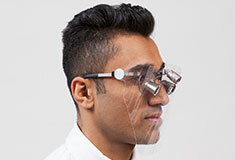 ExamVision uses Hi-index glass as standard. Highest quality glass, with multiple coatings to make the glass less reflective, and more resilient to scratching. 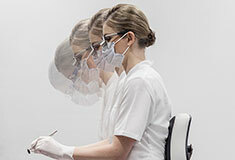 ExamVision uses multi-layer glass as standard, with hard coating and anti-reflective properties. Super hi-vision is an optional extra. 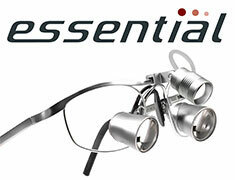 Kepler Advanced is the groundbreaking adjustable 4-in-1 magnification loupe. Kepler Advanced is the groundbreaking adjustable 4-in-1 magnification loupe. With the Turn`N´Click system, you can easily switch magnifications in a single, swift motion to achieve perfect precision for any procedure. 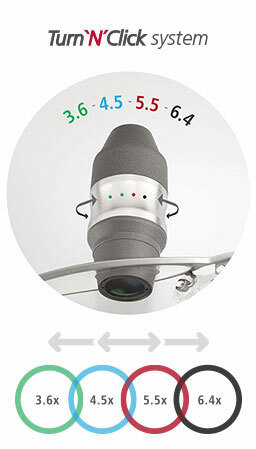 Kepler Advanced is the only loupe with 4 magnifications, for unrivalled versatility. Magnifications: 3.6x - 4.5x- 5.5x - 6.4x.